In Brief: Jadenu - A New Formulation of Deferasirox for Iron Overload (online only) | The Medical Letter, Inc. The FDA has approved an oral tablet formulation of deferasirox (Jadenu [ jade' new] – Novartis) for once-daily treatment of chronic iron overload due to blood transfusions (transfusional hemosiderosis) in patients ≥2 years old or chronic iron overload in patients ≥10 years old with non-transfusion-dependent thalassemia syndromes. 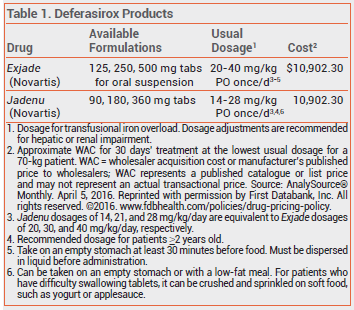 A once-daily, oral tablet for suspension formulation of deferasirox (Exjade) was approved in 2005 for the same indications.1 Jadenu and Exjade are the only once-daily oral formulations for iron chelation available in the US. No new clinical trials were required for approval of Jadenu, which was based on earlier clinical trials with Exjade. The most common adverse effects reported with use of deferasirox in clinical trials were diarrhea, vomiting, nausea, abdominal pain, rash, neutropenia, and increases in serum creatinine. Severe skin reactions, including Stevens-Johnson syndrome and erythema multiforme, have been reported rarely. Hearing loss and ocular disturbances, including cataracts, have been reported with deferasirox; patients taking the drug should have annual auditory and ophthalmic exams. Gastrointestinal ulceration and hemorrhage and renal and hepatic toxicity have also occurred. Deferasirox (Exjade): a new iron chelator. Med Lett Drugs Ther 2006; 48:35.